IG: @AfricanFoods: How to make doughnuts. 4 cups all-purpose flour 2 teaspoons baking powder 1/4 teaspoon salt 2 eggs 1 1/4 cups granulated sugar 1 teaspoon vanilla 2/3 cup milk 1/4 cup butter, melted vegetable oil or shortening for deep-frying desired coating or icing. In a medium bowl combine flour, baking powder, and salt; set aside. In a large mixing bowl combine eggs, sugar, and vanilla. Beat with an electric mixer on medium speed for 3 minutes or until thick. In a small bowl combine milk and melted butter. Add the flour mixture and milk mixture alternately to the egg mixture, beating on low speed after each addition just until combined. Cover and chill the dough for 2 to 4 hours. On a well-floured surface, roll the dough to 1/2-inch thickness. Do not stir additional flour into the dough; this can cause the finished product to be heavy and dry. Use a floured 2-1/2-inch doughnut cutter to cut the dough into rings. Dip the cutter into flour between cuts to prevent the dough from sticking to the cutter. Each cut should produce one doughnut and one doughnut hole. Reroll dough scraps as necessary to make about 16 doughnuts and 16 doughnut holes. If using an electric deep-fat fryer, heat the oil to 365°F according to manufacturer's directions. Or, in a heavy, deep large saucepan, heat the oil to 365°F. Tip: The amount of oil you'll need depends on the fryer you use. Follow manufacturer's directions if using a deep-fryer. If you are using a heavy, deep large saucepan, you'll want to pour the oil to a depth of about 4 inches -- deep enough allow the doughnuts to float in the oil. Ease a doughnut into the heated oil with a long- handle slotted spoon, taking care not to let the oil spatter. Fry the doughnuts, two or three at a time, in the oil for 2 to 3 minutes or until they are golden brown, turning once. Remove the doughnuts with the slotted spoon, allowing excess oil to drain back into the fryer or pan. Drain the doughnuts on paper towels. Repeat with remaining doughnuts. Cool the doughnuts slightly. To coat the doughnuts with powdered sugar or granulated sugar, simply roll them in the sugar until coated on all sides. To glaze, dip the tops of the doughnuts in the Chocolate Glaze, Powdered Sugar Icing, or Chocolate Powdered Sugar Icing (see Step 3, above). 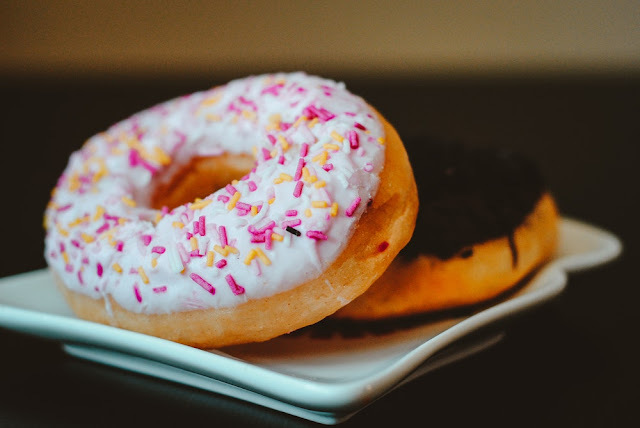 If desired, sprinkle iced doughnuts with chopped nuts, flaked coconut, or candy sprinkles. Allow the doughnuts to dry on a wire cooling rack.